Muggsy Bogues has retired from playing basketball for nearly 15 years, but he’s still one of the most iconic, widely-embraced players to come out of the Tar Heel state. That makes finding this awesome bobblehead of the shortest NBA player in history all the cooler. I found this little guy at a garage sale for 50 cents. It was made in China and produced by Match Up Promotions, a product branding and promotional company in Longwood Florida. Based on previous eBay sales, it’s value is somewhere between $60 and $75. Muggsy had a career playing basketball for about 14 years. But he’s best known for his time with the Charlotte Hornets, where he played from 1988 to 1998. The Miami Heat and Charlotte Hornets were set to enter the NBA for the 1988–89 NBA season. On June 22, 1988 the Hornets selected Muggsy in the expansion draft. As Bogues settled in Charlotte, he established himself as an exceptional passer, a great stealer and one of the fastest players on the court. 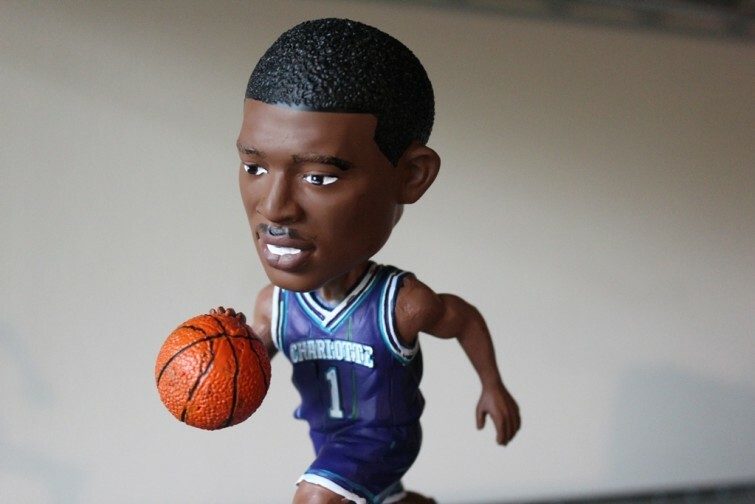 Bogues spent ten years in Charlotte as the Hornets, led by Alonzo Mourning and Larry Johnson, became one of the most popular teams in the NBA and a perennial playoff contender. Bogues was one of the most popular players in Hornets history, despite the fact that he never averaged more than 11.2 points per game in a season. As a short kid who lived in the Charlotte region, Muggsy was my idol. One of my favorite childhood memories associated with the 5 foot, 3 inch star was his role in 1996’s Space Jam, where he gets his basketball talents stolen by a very short alien. I probably didn’t catch a lot of the references in the Loony Toon’s-NBA mashup as a kid. But even today, that movie holds up as one of the best basketball movies I’ve seen. For anyone interested in learning more about Muggsy’s experience growing up in inner-city Baltimore and achieving success in the NBA, be sure to check out his autobiography– In the Land of Giants. Even for those who aren’t particularly big basketball fans, this book is really inspirational– especially regarding his struggles with poverty and prejudice. See, it’s stuff like this that I look at and wonder how many times I’ve passed up on similar stuff at garage sales without even giving it a passing glance. I’d have never guessed it was worth so much. I didn’t know that it was worth much until I went home and looked it up. Items like these things fluctuate in value all the time. When I see something that could be of value for 50 cents, I almost always pick it up!